In 1921, Daniel Chester French (sculptor of the Lincoln statue) and Henry Bacon (architect of the Lincoln Memorial) designed the fountain located at Dupont Circle in Washington, D.C. 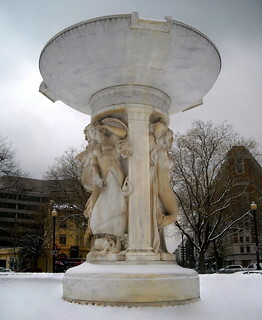 The fountain, a contributing structure to the Dupont Circle Historic District, honors Admiral Samuel Francis Du Pont and features three classical nudes symbolizing the sea, stars, and wind. Since the fountain is turned off at the moment, here's two pix of it during the summer.